You can find the tutorial on how she created for today’s art HERE. 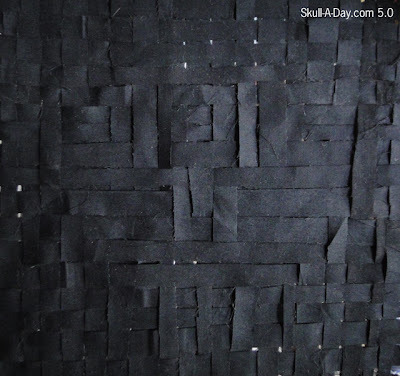 This is amazing, I don't recall ever seeing any fiber art that was created using the shibori method. Thank you for sharing your work with us and also showing off your tutorial. 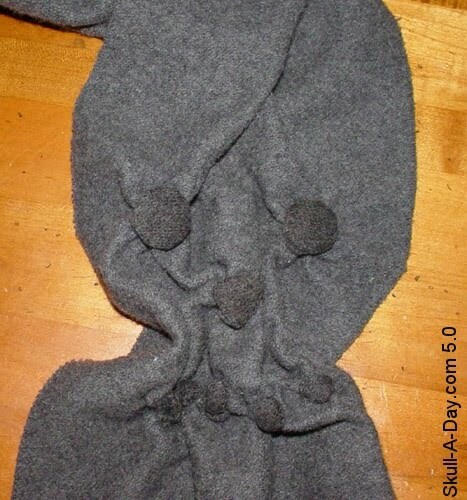 Now we all can take a chance in creating something with this method. 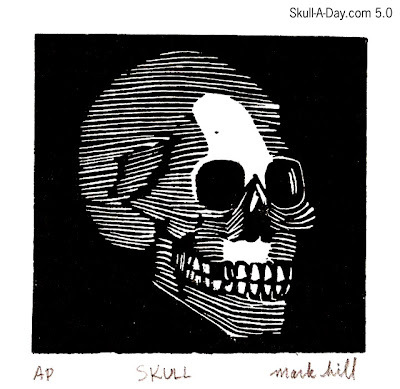 I also got several Skull-A-Day friends to participate as well including Everything Burger's Charlton Yu and Freehand Profit from MASK365, so expect to see some great new work over the next few weeks. Kim Spencer is a designer who works and lives in Richmond, VA.
Greetings come to you from Gert Vandenweghe who hails from Belgium. He's here today with a skull that invokes inspiration with an ingenious message. 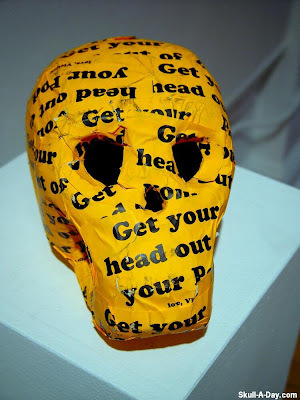 I'll let him explain it better, "I made a skull out of ceramic with a hidden message inside. I made the message visible by taking x-ray pictures of it. In between the 2 x-ray pictures there's an x-ray of my own skull." "The work is about documenting and proving the thoughts of people who once lived. By proving dreams and thoughts in a very technological way and hoping to have proof of a soul." Cognito ergo sum indeed, Gert. Your wonderful work is a grim reminder that our thoughts make us who we are. It's not the body of a man that makes him what he is; it's what he puts his thoughts into that will define who he becomes. 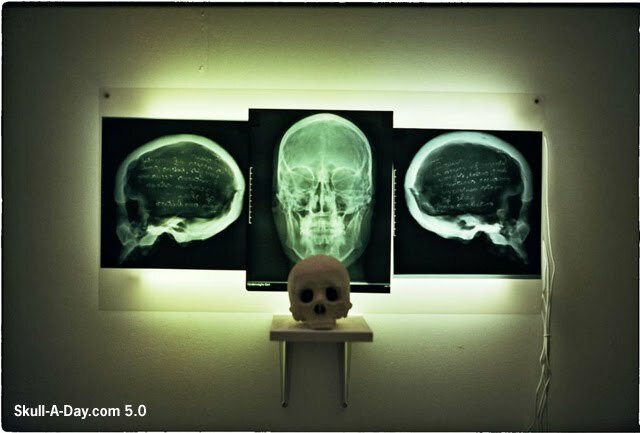 We are what we choose to be, and Gert makes us see that by displaying the thoughts in his skull for us in plain view. Thanks for sharing your them with us. 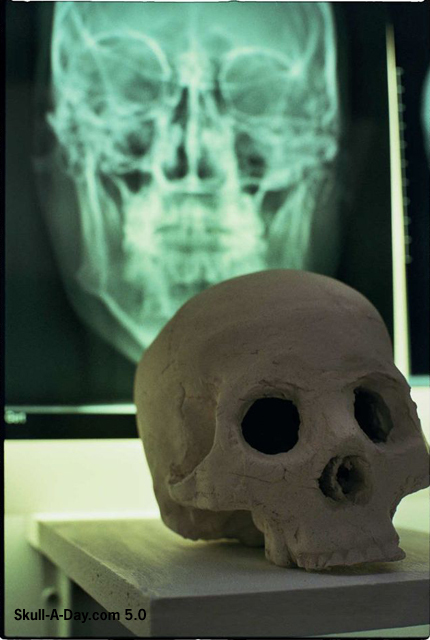 There is something disturbingly fun about the process of creating a skull only to crack it open with sticks. Thank you for sending in your creation to us and allowing us share in your celebration. Lucky number week 13 brings us another round of great hidden skulls lurking in the most obvious of places. Daniel Muñoz of Buenaventura, Valle del Cauca, Colombia came across this toothy chair at the home of a client. Looks like a near relative of the Skull Master's own Skairy. Mike Leemann from Charlottesville, Va discovered what might be the first cylops skull simulacra. 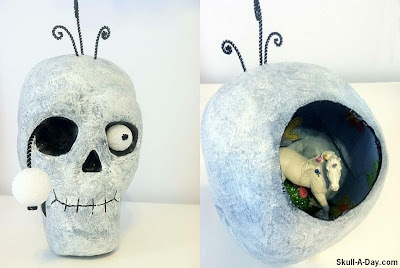 And another Virginian, Dolores, caught this dazzling skull while stopping for a bite. "We were coming home to VA from Boston having attended our neice's graduation from Northeastern. 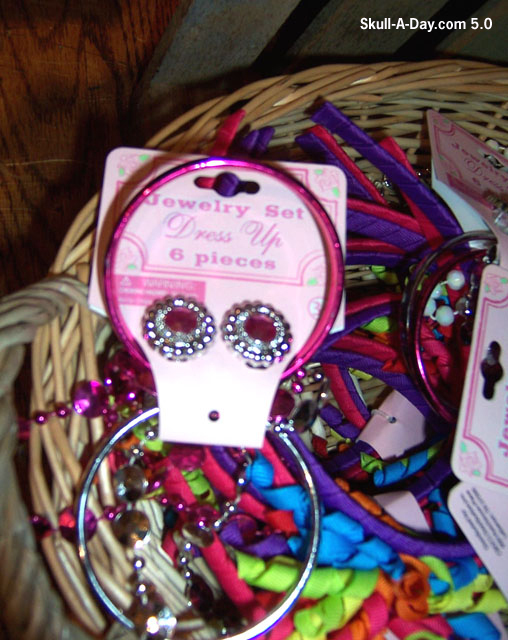 Of course when you stop at The Barrel you have to look around at the tchotchkes and voila...there it was....earrings and bracelet Skully! 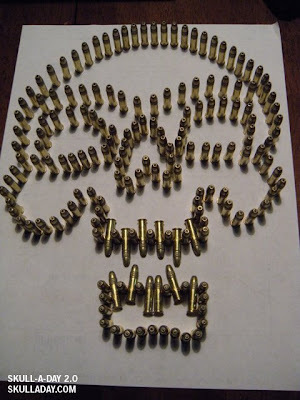 :)"
These are all wonderful examples of just how sneaky these skulls can be. If you're not paying attention they might just pass you by. If you are then be sure to submit your pics when you do capture one. Thanks again, skull hunters! Greetings this weekend from a cheerful chap courtesy of Sophie Adamson, from Plymouth UK. 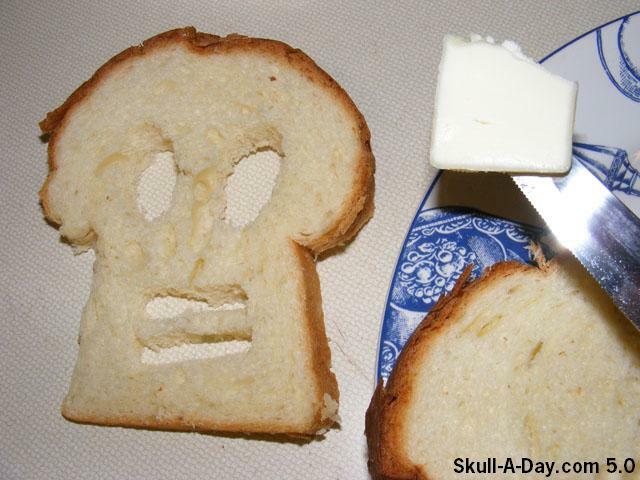 A sinister smile makes this Saturday's skull suspiciously sneaky. 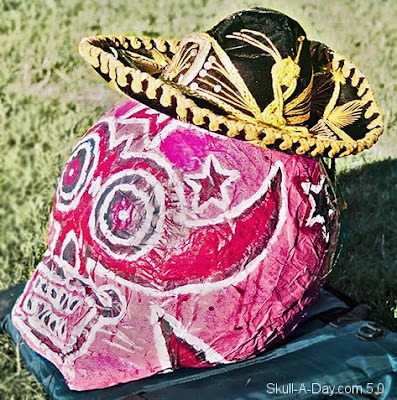 This brightly colored skull reminds me of the traditional Japanese noh masks. A flair for the dramatic and ornate details really make this skull's colors shine boldly. He would definitely have been the underhanded proprietor of some evil scheming in any plays that he might have appeared in. 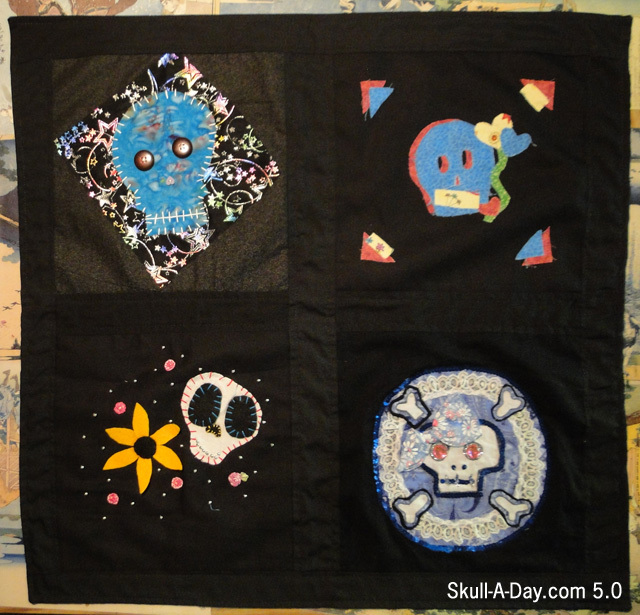 Thanks for the stellar skull, Sophie! Our first corky offering comes from thirteen year old Jeno D from Carmarthenshire, Wales, UK who made this skull out of a cork floor tile. 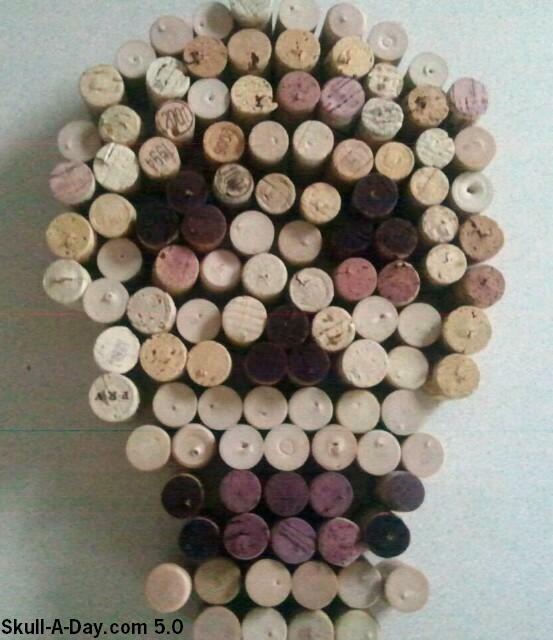 Next up is Amy Dietz in Richmond, VA who made this skull from wine corks! I truly appreciate when we have weeks where whatever powers that be align themselves and we have our submission box filled by two different artist working in the same medium and creating two distinct pieces. Thank you both for submitting your work for us to share. For more corky skulliness flashback to some of the editor's pieces HERE, HERE, and HERE. I was reminded of this piece when my twin brother and I made plans to go to the shooting range this weekend for a bit of target practice. 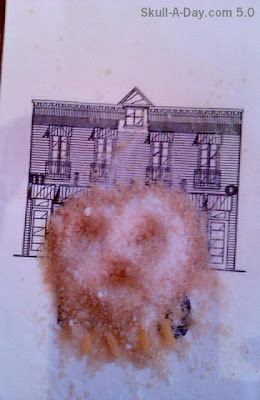 I was super impressed when fellow Texan Michael “Ironmike” Box submitted this way back in March of 2009. It gets me "fired" up seeing the out of the ordinary mediums in all of our skull art submissions and it makes me want to take a "shot" at trying something unusual myself. Inspirational as always, and a great piece ammunition art. After putting together all those quilts, I have a lot of scraps left over. 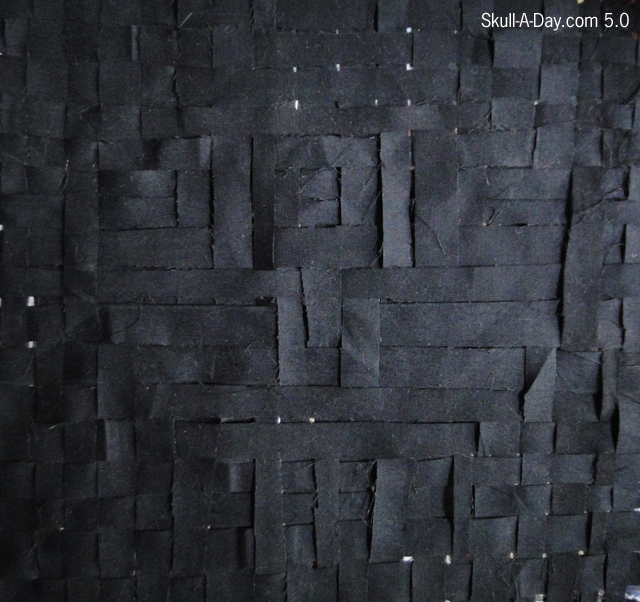 I decided use some of the longer pieces and weave a skull with them. This came out subtle, but I haven't woven in years and I wanted to use the black scraps. I might try this again in the future with multiple colors. Mark B Hill is back again with another great linocut block print skull. 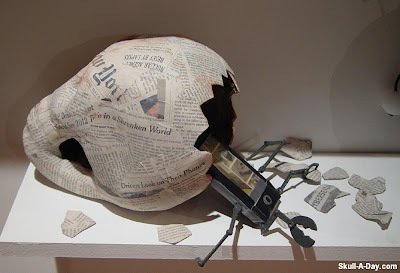 Of all the piece that Mark has created, this is one of my favorites. I love the use of the defined lines to create shading and enhance the details.I like how they looked stacked and flow with the curves of the skull. They help make the highlights and dark areas pop. 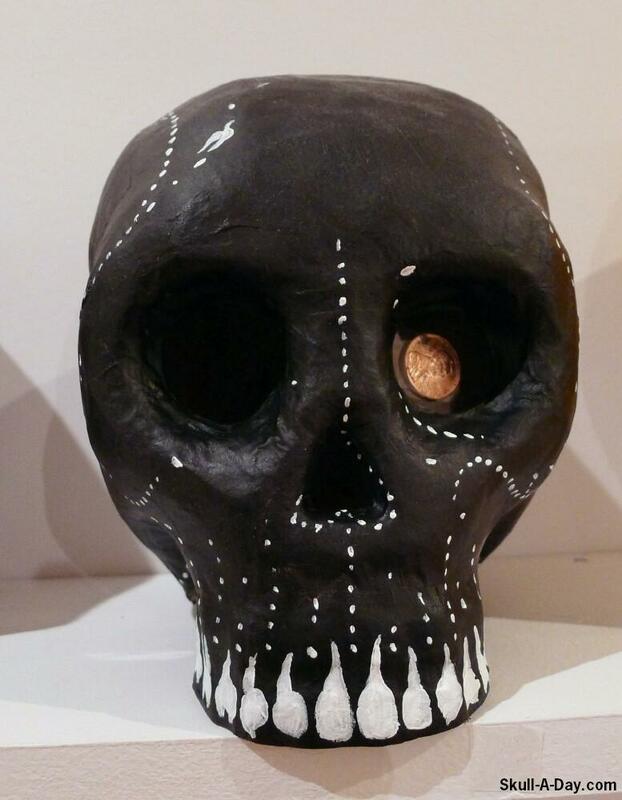 Sara Yzaguirre from McAllen, Texas sent us a skull platter. 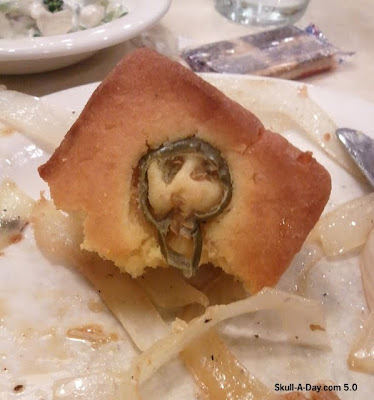 Thank you all for submitting such tasty art pieces that not only will sustain your body, but also your mind. She's part of the elite ranks of Skull-A-Day tattooed folks: Deacon who got my Ornamental skull on his back; Denis who got a skull I drew for him when I signed his copy of my book Skulls; Kevin, GlobGlob & Drew who used the Skullphabet for their tattoos; Katrina who had a tattoo designed for her by Skull-A-Day fans; Danny (who got the Rorschach Skull); Tammie who got my Acorn Skull; and of course Tatman and myself! Any other Skull-A-Day tattoos out there I don't know about? Please see this artist's exhibit page for purchasing info. 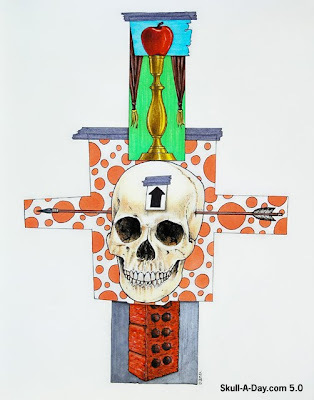 Raye Mayo sengt us this query, "I'm a fan of your website, and I wonder if you will include my pen & ink drawining, which includes a skull (natch)." Of course we will, Raye. Sharing skull art will always bring friends together, especially when they're best friends(Lucy & Ethyl I believe). You've made this drawing so soft in color that it really looks like a watercolor painting. At least to me it does. 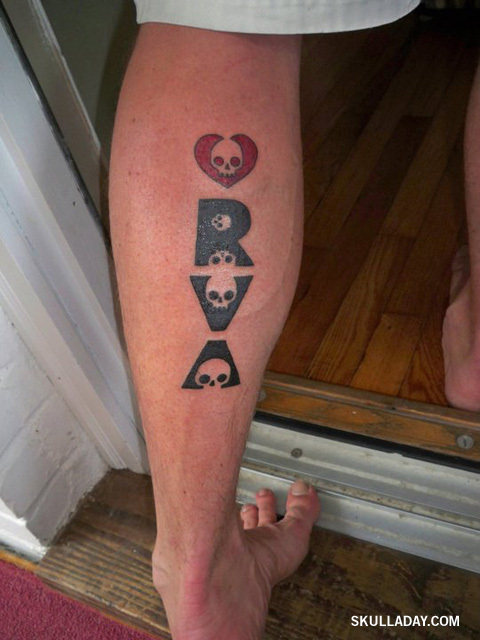 Thanks for sharing your skull with all of our friends, Raye! 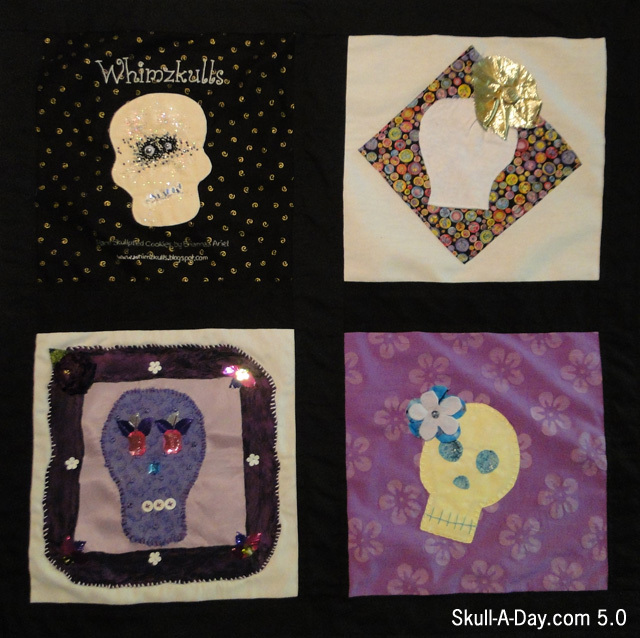 There is ONE DAY left to bid on the remaining 5 quilts. Remember all of the proceeds go to Becky's Fund, which is a non-profit organization the helps victims of domestic violence and teaches domestic violence prevention. You are helping out a wonderful cause by purchasing a quilt. This quilt is made from squares by Sarah Harris, Jennifer Gorman, Michalee Sloan and Ann Scraggs. 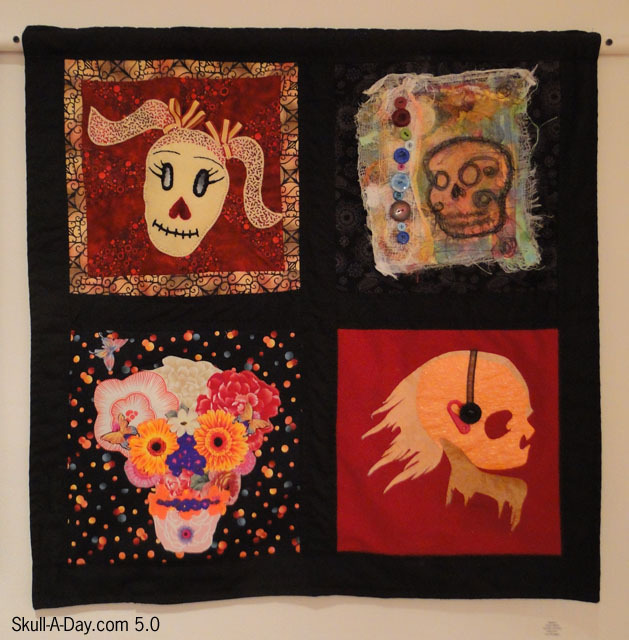 It was hanging at Gallery 5 for a month with the Skulls show, that was part of our Skull Appreciation Day festivities. 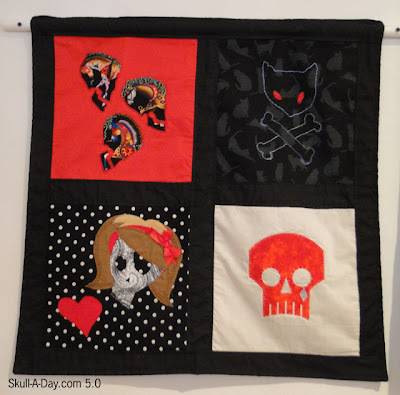 This quilt is made from squares by Sue McGuire, Nikki, Jamie Rhodes, and Tiffany Berkovitz. 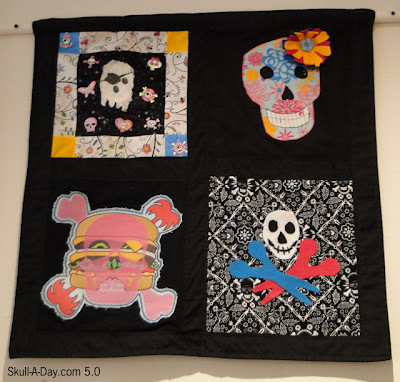 It was hanging at Gallery 5 for a month with the Skulls show, that was part of our Skull Appreciation Day festivities. This quilt is made from squares by Melanie Kutschke, Ann Stelzer, Charlton Yu and Rikki Traina. 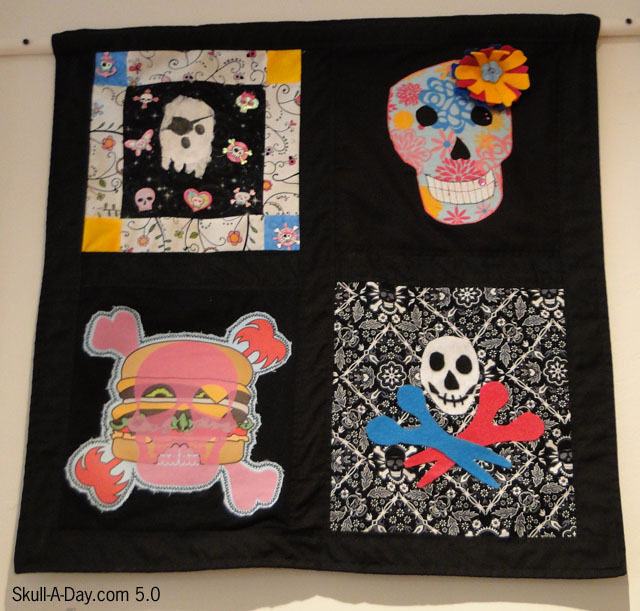 It was hanging at Gallery 5 for a month with the Skulls show, that was part of our Skull Appreciation Day festivities. This quilt is made from squares by Ember Griffin (age 18), Jessie Woods (age 15), Adean Stranahan (age 17) and Melissa Kennedy (troop committee member). These ladies are part of Girl Scout Troop #202 from Eureka, CA. This quilt is made from squares by Karleen Price (troop mom), Kira Denny (age 17), Lola Presler (troop advisor), and Terra Price (age 11). These ladies are part of Girl Scout Troop #202 from Eureka, CA. Elisa Rose Mountain from Chicago created this oil painting titled "Skull Shakti Self Portrait". If you are not familiar with what a Shakti is, it is thought to be a powerful energy of creativity, change and fertility found in Hindu religion. This painting shows a division of life and death working as one. I like the blending of the two together. 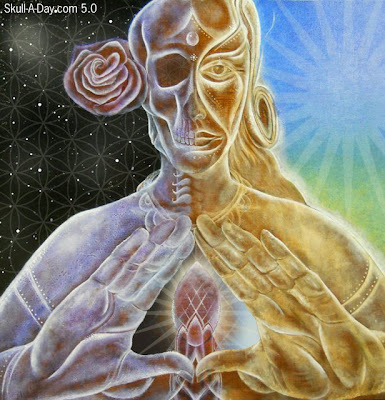 Both come together, so being depicted together is very fitting. It's time to feast again with our skull hunters for this week's round of yummy simulacra. Killer Zombie Robot pondered whether it should be Skullapeño or Jalapeñskull when he "Found this guy baked into some cornbread. 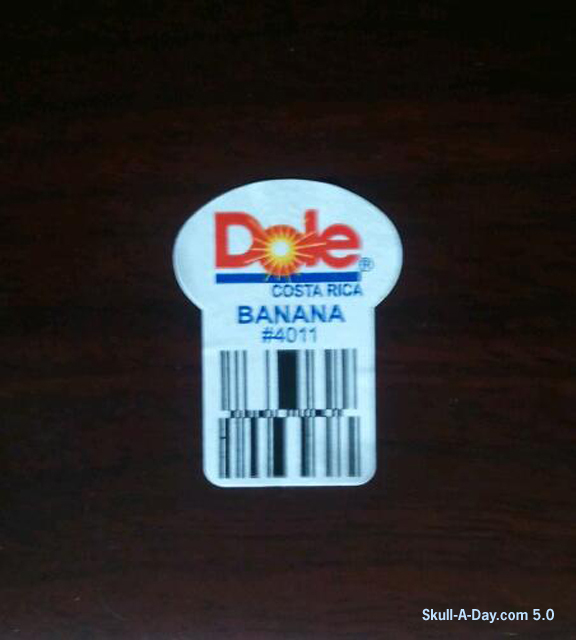 He was tasty." 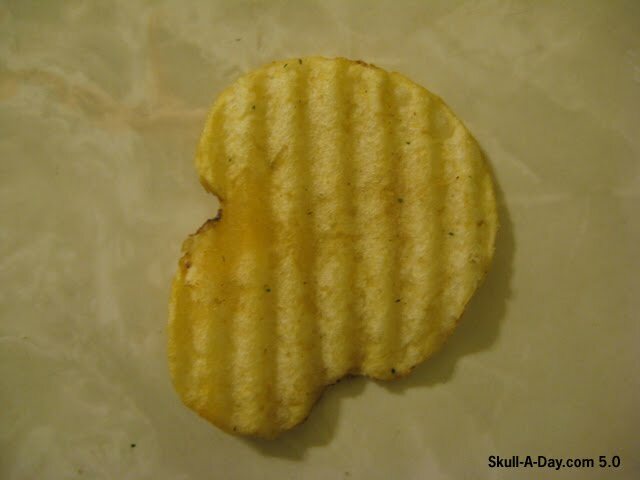 This salty skull was found by Keltie in Kingston, Ontario who writes, "This is a potato chip skull that I found while eating some President's Choice Lemon Chicken chips. I offered it to my daughter after taking the picture but she started throwing chips on the floor so I ate it instead." 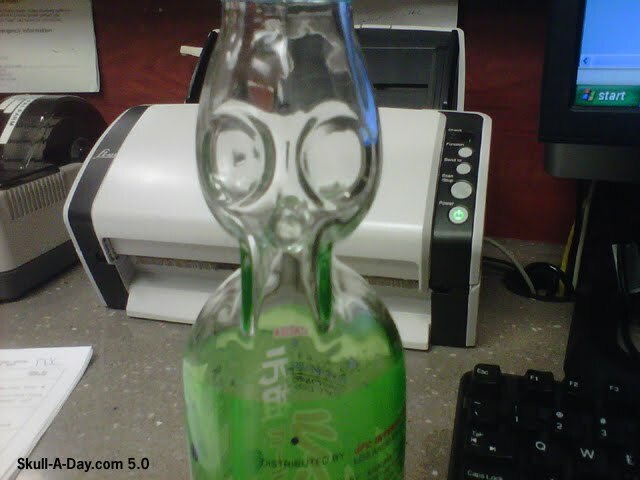 And to wash it all down Nicole Clak sent us this Japanese soda skull bottle and this note, "I had posted this picture on your FB page. I can't remember the brand name, but it is a Japanese soda that we get quite often. Instead of the pop top we are used to, there is a small marble sealed in the top, and you use the stopper provided to push the marble down into the neck of the bottle. This time though, when I turned the bottle to the side, I noticed it looked a lot like a skull!" Thanks again to everyone for a tasty way to spend our Sunday. If you find yourself about to devour a skull in your food then snap a pic and send it to us before you get to digesting it. It's truly fitting that Dan used many different tools to create this piece because it reminds me that life seems easier when we find a balance of our own. Especially while standing on a brick with an arrow in our head. Thanks for the colorful reminder, Dan! 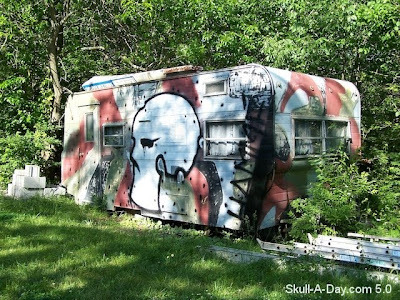 Gary C (no relation) sent us a picture of a trailer he skullified which he called a “Hillbilly Subway Car”. You may remember Gary from the skull we showed you over a year ago that he did on his car hood. Here is an update just in case you were wondering about what it looks like a year later. 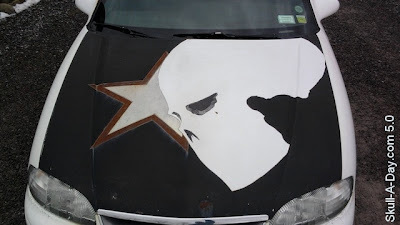 Also be sure to flashback to the original post about his car hood here. It is so great to be able to see the new projects you have worked on as well as the art of the past that is meant to change with time. I love how the trailer and the car match. Do you ever take them out together? Thank you for sharing this update with us and we will keep you in good thoughts so that we might get the chance to revisit your ever changing art again next year. He had now officially joined the elite ranks of fellow Skull-A-Day tattooed folks: Deacon (who got my Ornamental skull on his back), Denis (who got a skull I drew for him when I signed his copy of my book Skulls), GlobGlob (who also used the Skullphabet for a tattoo), Katrina (who had a tattoo designed for her by Skull-A-Day fans), Danny (who got the Rorschach Skull), Tammie (who got my Acorn Skull), Drew (who also used the Skullphabet for a tattoo), and of course Tatman, Abby, and myself! 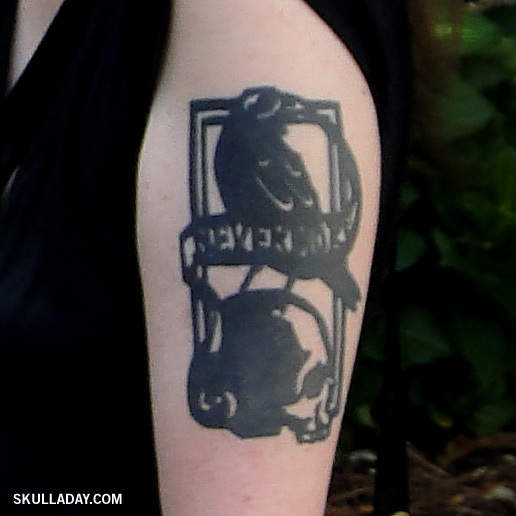 Any other Skull-A-Day tattoos out there I don't know about? 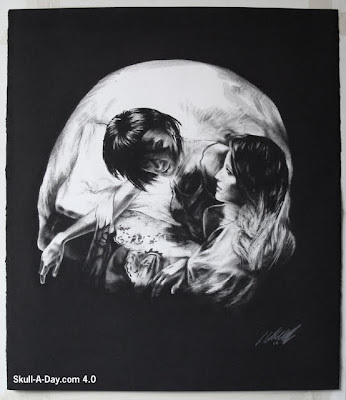 I have the pleasure of seeing this skull quite often as it is still saved in my folder of posted pics. The thumbnail version only looks like a skull, and the details of the girls blend in like they aren't even there. It's only after I enlarge this that I remember how great a job Tom did with creating two pictures in one. Thanks again for blowing our minds, Tom. 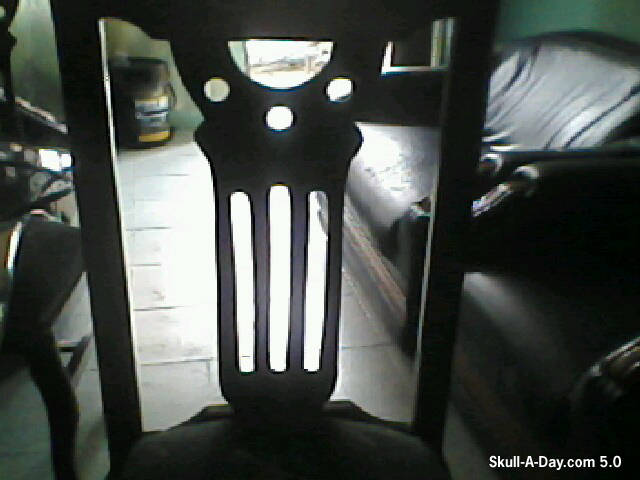 If you'd like to see more optical skullusions then be sure to click here. There are still 5 quilts that haven't sold, so I'm relisting them one last time. I've dropped the price down a lot, so they are very affordable. Remember all of the proceeds go to Becky's Fund, so you will be helping out a wonderful cause.